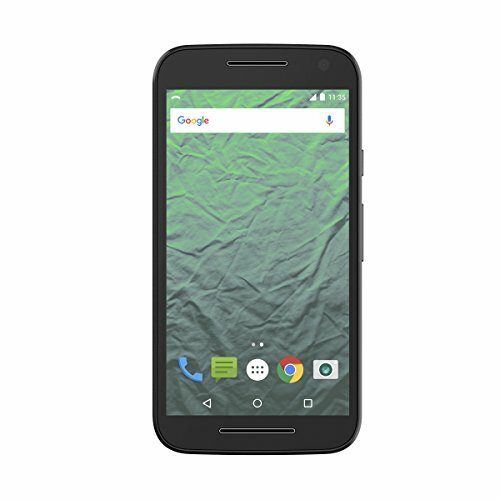 Available without a contract on Republic Wireless' low-cost monthly prepaid phone plans, the Moto G (3rd Gen.) with 4G LTE is the “do-pretty-much-anything-you-need” smartphone that's also affordable. It includes all the advanced features of Android Lollipop 5.1, is water resistant, and has an all-day battery to last as long as you do. Republic Wireless Moto G (3rd Gen.) Specs:- 5" 720p HD display with the strength of Corning Gorilla Glass- 13 MP Quick Capture camera with Autofocus, Manual focus, 4X digital zoom, Panorama, Slow motion video, Auto HDR, Video iHDR and exposure controls; 5MP front camera- Water Resistant: Protection from splashes and accidental drops in water- 16GB internal memory with microSD card slot for up to 32GB of removable storage + 1GB RAM- Networks/Bands: Wi-Fi: 802.11b/g/n, 2.4GHz, Cellular (Sprint): CDMA/EVDO Rev A (800, 850, 1900 MHz); LTE B25, B26, B41Comes with Republic Wireless Monthly Pre-paid Phone Plan The Republic Wireless Refund Plan is set up so that you get paid back for the cell data that you don't use - each and every month. First, choose where you want to start on the plan: $5/month - Unlimited Wi-Fi calling, texting and data$10/month - “Republic Refund Base Plan” - Unlimited Wi-Fi calling, texting and data + unlimited cellular calling and texting$17.50/month - Unlimited Wi-Fi calling, texting and data + unlimited cell talk and text, 0.5 GB on-network cell data $25/month - Unlimited Wi-Fi calling, texting and data + unlimited cell talk and text, 1 GB 4G on-network cell data$40/month - Unlimited Wi-Fi calling, texting and data, unlimited cell talk and text, 2 GB 4G on-network cell data Plus, add on data whenever you want! Pay as you go for $7.50 per half GB or $15 per GB *Pro tip: Lots of people like to choose the $10 Republic Refund Base Plan and add on-demand cell data if they need it. If you have any questions about this product by Republic Wireless, contact us by completing and submitting the form below. If you are looking for a specif part number, please include it with your message.